If you’re looking for a nifty little suitcase, then I think this case might be exactly what you’re looking for. 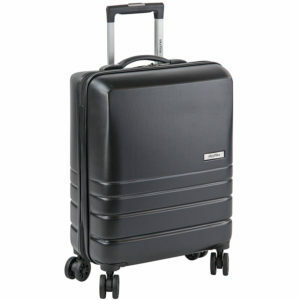 With constant advances in the luggage market, its hard to know what suitcase is perfect for you. This smart little case came to me just in time for a long weekend away, and I was so impressed at the excellent price (CHECK PRICE NOW!). Luggage malfunctions should be the last of your worries when you travel. Which can be stressful enough in its self, so make sure you take the stress out of your holiday by ensuring you have a high quality case like this one. At first glance, I loved design. Its a very smart case, that features some fine detail so it stands out from the crowd, without being too loud! I love the subtle details and the clean lines, and the slightly metallic finish to the case. Its not your regular boring black case, but suits all styles and stands out a bit from the crowd. 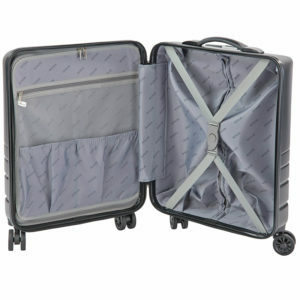 It is made from high quality ABS material, which is the latest in lightweight luggage technology. ABS is ultra lightweight and durable, and is incredibly resistant against impact and heat. The amount of strain put on our suitcases not just by us, but mostly by baggage handlers means that our suitcases go through so much stress! Having a hard shell ABS suitcase puts my mind at ease, knowing the impact that they can go through, I feel a little more safe knowing that my belongings are secure. The four 360 degree spinning wheels make for super smooth movement and there is two wheels in each set for extra strength. The wheels actually feel really strong, which is where a lot of light weight cases struggle, as the wheels are often flimsily attached to the case. Meaning you can glide through the airport, even if you are in a rush and have to run, like I often do! This suitcase is super easy to pack, as its divided into two sides. I like my cases set out like this as it means I can half all my clothes neatly folded in the side with packing straps, and other bits and bobs like shoes and accessories on the other side. A case like this is perfect for someone who likes to pack in a very organised and neat way! So it has a large netted zip pocket, two separate shoe pockets, which are great to avoid getting your clothes dirty, and elasticated clothes straps. It serves all of its purposes when it comes to keeping your case tidy and organised. I was easily able to pack everything I needed for a four day trip, with a bit of space for shopping too! The telescopic trolley handle is super comfy and can be adjusted to any height, and the handle actually sets back fully into the case, so its easy to store and stack. The zippers are also lockable and a combination padlock is included. Overall I was really impressed with this case. It served me excellently for the trip I was on, and I didn’t have to worry about anything to do with the case. As always I ended up running to my gate, and the case ran so smoothly along side me, no more huffing and puffing with my suitcase toppling over and getting dragged along behind me. I loved how easy it was to pack, and how spacious it actually was in the end. It looks small but with all the compartments its easy to pack a whole load of stuff in there. When I got my suitcase home after my hectic weekend away, there was barely a scratch or nick on it and the wheels were as perfect and when I unboxed it. I would definitely recommend this case, and will be looking out for other items in the Skyflite range. It just goes to show that sometimes a cheaper price doesn’t necessarily mean a compromise in quality. if you’re looking for a practical and reliable suitcase at an excellent price, this suitcase is the one for you!